Very often we are obliged increasing either the energetic level of foods given or the workload facing the metabolic requirements of horses whom have to guarantee high standard performances. In this way these changes of the ancestral nature of the horse often entail raising of stress levels of our athletes. Other than habits that are easily showed up in the stable (support trick, dancing bear, etc.) there are disorders much more underhanded as gastric ulcer and pre-race distress. This formulation is useful since it is integrated with natural products designed to preserve the integrity of stomach lining and obtaining stabilization in the mood without interfering on the athletic potential. We all know how much stress may be responsible for gastric implications even in human health and how much it has negative effects on the digestive system. 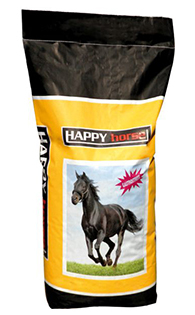 We deeply recommend, as per the other range of products, the handing out of long fibre forage plus water with no pollutants, and for each single case trying to verify which are the pre-disposing factors that may induce anxiety.